Did I get your attention with the word FRIES? Okay, maybe I lied but these are still pretty darn satisfying and a little nicer to your insides than potatoes fried in scary oil. But, damn, I do love a good French fry. I digress. This awesome side dish comes together lickety-split and would be a great side to any protein, even some tacos, with the smoky cumin, toasted pumpkin seeds and cilantro. No ketchup needed. 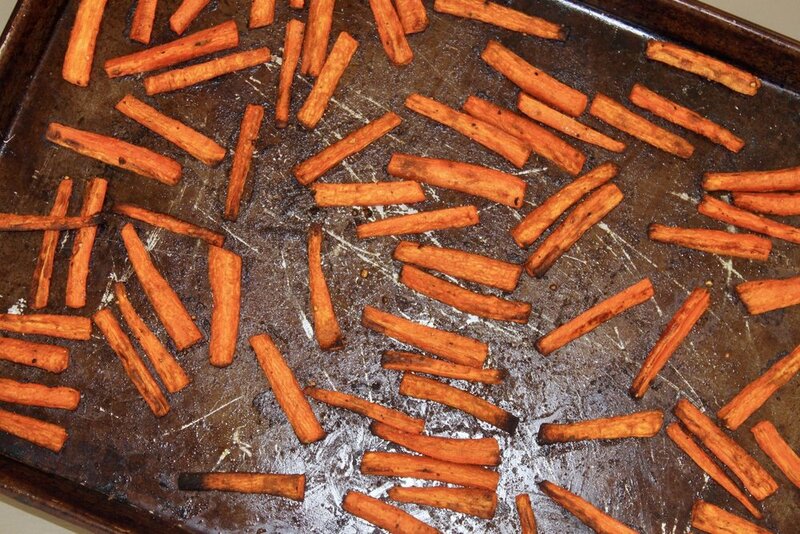 In a medium bowl, toss carrots with olive oil, cumin, salt and pepper. Spread carrots on sheet pan in a single layer with a little space in between the carrots so they can really caramelize and get some crispy edges. Roast for 25 minutes, stirring halfway through. Remove from oven and top with pumpkin seeds and cilantro, if desired.